I happen to be a sucker for stories dealing with questions of real and virtual identities and the connections between reality and fiction, so when I read that Blueeyedboy is about a man who posts morbid entries on his blog and the story revolves around the fact that it’s not possible to determine whether his blog entries are fictional or not, I immediately wanted to lay my hands on this book. The protagonist of the novel is man called BB who works as a cleaner in a hospital, still lives with his oppressive mother at the age of forty-two, and still tries to deal with the neglect and pain he suffered as a child because his brothers were both better loved by their mother. In real life, BB is a reserved and unobtrusive man, but in a social network site called badboysrock he builds himself another identity – that of a cynical, strong-willed and cruel man – and he publishes supposedly fictitious stories on his blog under the assumed name Blueeyedboy, in which the hero (probably his alter ego) cunningly takes revenge on everybody who had previously wronged him. In the meantime, Blueeyedboy also watches and manipulates the other members of the social site. The other narrator of the novel is Albertine who also writes a blog – from her entries, we learn the other side of Blueeyedboy’s stories. However, just like in the case of Blueeyedboy, it’s not possible to determine whether Albertine’s entries are about real or fictitious events, either. Blueeyedboy and Albertine know each other in real life as well, and they share a couple of old secrets which are slowly revealed during the course of the novel – but, again, it’s not at all certain that what is revealed is the reality – it may as well be yet another fictive story. 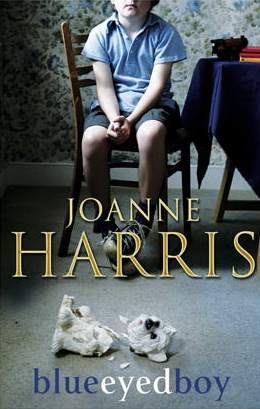 All this might sound a bit complicated but this complexity lends a lot of charm to the novel, and I deeply admire Joanne Harris for the way she keeps both the meandering story and her two troubled protagonists in hand. Besides, she manages to convey how the real and virtual identities of her main characters interact and overlap with each other, and she cleverly negotiates her way between the real and fictitious stories written by her admittedly unreliable narrators. Besides the fact that the main story is even more tricky than that of Harris’s other tricky novel, Gentlemen and Players, Blueeyedboy can be a thought-provoking read for everyone who has any kind of online life. The main character, for instance, sees the possibilities arising from the overlapping of the real and the virtual world very clearly, and he knows that his virtual identity is on the one hand a fictive (and untrue) one – but on the other hand, the virtual Blueeyedboy is perhaps exactly the person he always wanted to become, so in a sense it’s more truthful and more real than reality. However, BB is not someone who is content with simply creating an ideal online persona for himself: he also enjoys manipulating and unsettling others and he loves leaving everyone in doubt as to what’s true and what’s untrue. Besides the fact that BB is aware of other people’s obsessive self-expression, he also knows how to make others love and pity him. His virtual affair with a fat woman, Chryssie is a case in point. The girl clings to BB’s (or rather: Blueeyedboy’s) every word, she would like to meet him in real life as well, and she keeps sending her virtual hugs and kisses without restraint whenever she feels that someone has hurt her poor little Blueeyedboy. I’ve had some kind of online life for about fourteen years now. During this time, there were periods when I talked to a lot of people on chat, periods when I was heavily involved in online gaming, periods when I was mainly hanging back and only reading other people’s stuff, and now I write a blog, I’m a relatively active member of a social site for book-lovers, and now and then I also participate in a couple of games which go around in the blogger community. Now, based on these experiences, I think that Joanne Harris depicts one facet of online life remarkably well: the way a personality can appear in a virtual space and the fact that sometimes the borderline between reality and fiction, and a person’s real and virtual, assumed persona gets blurred. Besides the exceedingly interesting and very cleverly managed main theme of the novel, Blueeyedboy features several other exciting elements as well. One of these is that the book features the same public school for boys, St Oswald’s which also appears in Gentlemen and Players. This was only my second novel by Harris, so I don’t know whether she often uses self-references, but anyway, I like games like this very much – I very much like writers who create a kind of private world in their oeuvre, and I like to revisit their private worlds in different novels and learn something new about it, perhaps from a slightly different angle. By the way, Gentlemen and Players and Blueeyedboy are also similar in the sense that they both feature highly unbalanced and mentally unstable protagonists, and that they both manage to fool the reader in a very delightful manner. At least Harris managed to fool me fine again, and even though I knew something was up, I couldn’t figure it out and I felt dumbfounded quite a few times while reading this novel. The musical references in the novel are also worth mentioning. Blueeyedboy’s blog posts always feature a song – which either underscores the atmosphere of the entry, refers to its content, or comments on the story in an ironic fashion. And even though I wasn’t reading this novel with YouTube open in front of me all the time, after finishing the book, I checked out quite a few of the songs, and they indeed added something to effect of the novel. The only weakness of the novel for me was the translation, but you probably won’t be reading this novel in Hungarian, so I won’t go into details here. I’m pretty sure this novel must be an even more delightful read in English. I had not read any of Joanne Harris’s novels before this one last year. Though I often came across her nice-looking books, which reminded me of children’s books, and I watched the movie version of Chocolat several times and enjoyed it very much, I did not feel any urge to read any of her stories. 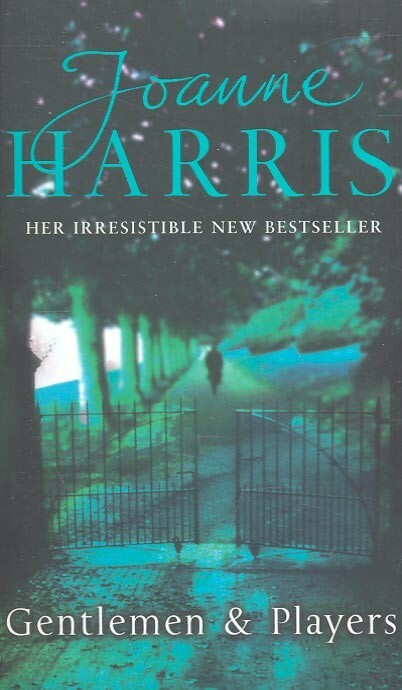 Then a few months ago I read a review of a Harris novel on one of my favorite book blogs, and I decided that it was time to go ahead and finally read at least one of Ms. Harris’s works. I picked Gentlemen and Players more or less at random, and it turned out to be a good choice. As this book has been quite a hit among Hungarian book bloggers and many reviews and story outlines have already been published, I refrain from going into too many details regarding the story. So let me stick to the basics: the novel is set in St Oswald’s, a renowned public school for boys, where a dangerous game unfolds between a mysterious trickster and an old member of the faculty, the Latin teacher Roy Straitley, who is heading towards his 100th semester as a teacher. The evil person who is doing his dirty tricks among the antique walls of the school has only one goal in his life: to destroy St Oswald’s and this way make up for the injuries and failures of his past, for which he lays the blame on the bureaucratic (and, for him, previously inaccessible) institution. The story is told from the alternating point of views of Straitley and the evil person (whose name I withhold on purpose), and from the two intertwining storylines we slowly come to know the events of the past that led to the trickster’s wish for revenge, and we also get acquainted with the people who took important parts in those events and who are still haunting the school. My first impression of the novel was less than favorable. I was irritated by the abundance of telling names (such as Light, Meek, Strange, Dare and so on), I could not tell the different characters apart, and most importantly, I had no idea whom I should focus my attention on, out of the dozen characters introduced all too quickly. When I managed to sort out these distractions after a couple of pages, I came to think that even though the novel is undeniably readable and dynamic, it is still a long way from being a remarkable story. And in the next step, I suspended my skepticism (and disbelief) and started to enjoy the novel. I assume I do not have to dwell on this again, as those who had read my earlier posts may well be aware of the fact that I am keen on all kinds of interesting narrative techniques: having two or more narrators in a novel, alternating between different points of view and having the story jump between various time periods always please me immensely. Gentlemen and Players sufficiently gratified this obsession of mine, and after the first 50-60 pages I hugely enjoyed the alternating storylines of the evil character (symbolized by a black pawn chess figure) and Mr. Straitley (symbolized by the white king). I found the wit, wisdom and unrelenting investigating spirit of Mr. Straitley very interesting, and I also liked the extent to which he seemed to love his profession and his students. However, I found the parts of the black pawn even more curious and unsettling, as it is in his parts that we get to know the most about those old events which made him become such a maniac, secretive, vindictive person that not even in his adulthood can he fit in and live a normal life. Then came the last 50-60 pages with the oft-mentioned great twist, which made me reconsider all the previous 400 pages, and after which I just sat in my chair for minutes and stared ahead with a huge smile on my face, trying to figure out how Ms. Harris managed the feat that I never even thought about this solution during the whole course of the novel. It is not as if the story became very cheerful or light by this turn, I simply enjoyed the fact that Ms. Harris could fool me in such an elegant manner, and I felt like starting the book again from the beginning, and this time methodically look out for all the small misleading or else revealing details, which were there from the very first page, only I chose to ignore or misinterpret them. I think I will re-read the novel some years later and will try to find out where and how exactly I got misled. The great twist of Gentlemen and Players very much reminded me of another novel I read earlier last year, but I am afraid that even mentioning the title of that novel would spoil Harris’s story, so I keep this thought to myself. All I want to add is that Ms. Harris managed to convince me with this novel and I will not hesitate to read some of her other stories in the future, should I wish to have some good entertainment.